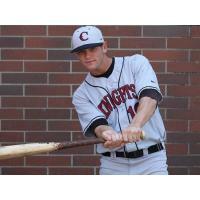 Center fielder Chandler Anderson was named the Most Valuable Player of the 2018 Corvallis Knights in a vote of the coaching staff and team CEO Dan Segel. A rising senior at the University of Utah from Park City, Utah, Anderson played outstanding defense and led the Knights in batting average (.337), doubles (20) and steals (26). He had five homers and 34 RBIs in 62 total games. Chandler was also the recipient of the team's Joe Segel Hustle Award. It is awarded to the player who best exemplifies hustle, grit and desire and is named after team co-founder Joe Segel, a key member of the club's board of directors. Right-hander Landen Bourassa earned Top Pitcher honors. A rising senior at the University of San Francisco from Lethbridge, Alberta, he was 5-1, 1.83 in nine total games, with 47 strikeouts and only nine walks in 47 innings. Right-handed pitcher Abbott Haffar was named the club's Top Prospect. A sophomore-to-be at UC Riverside from Simi Valley, Calif., he was 5-0 with a 1.14 ERA in 13 total appearances, with three saves and 33 strikeouts in 31.2 innings.